Ron Larson received his Ph.D. in mathematics from the University of Colorado in 1970. At that time he accepted a position with Penn State University, and he currently holds the rank of professor of mathematics at the university. Larson is the lead author of more than two dozen mathematics textbooks that range from sixth grade through calculus levels. Many of his texts, such as the tenth edition of his calculus text, are leaders in their markets. 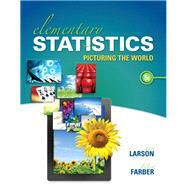 Larson is also one of the pioneers in the use of multimedia and the Internet to enhance the learning of mathematics. He has authored multimedia programs, extending from the elementary school through calculus levels. Larson is a member of several professional groups and is a frequent speaker at national and regional mathematics meetings. Betsy Farber received her Bachelor’s degree in mathematics from Penn State University and her Master’s degree in mathematics from the College of New Jersey. Since 1976, she has been teaching all levels of mathematics at Bucks County Community College in Newtown, Pennsylvania, where she currently holds the rank of professor. She is particularly interested in developing new ways to make statistics relevant and interesting to her students and has been teaching statistics in many different modes—with the TI-84 Plus, with MINITAB, and by distance learning as well as in the traditional classroom. A member of the American Mathematical Association of Two-Year Colleges (AMATYC), she is an author of The Student Edition of MINITAB and A Guide to MINITAB. She served as consulting editor for Statistics: A First Course and has written computer tutorials for the CD-ROM correlating to the texts in the Street Series in mathematics.